RETIREMENTLAND « THE BRYCE IS RIGHT! – Do we ever truly retire? I have written about retirement in the past and I still regard it as a mystery. I have had more friends “check out” recently for a variety of reasons. They all claim to be happy to be retired, that they have been planning it for years, and that I am a chump to keep working. I consider this all a bald-faced lie. I’ve seen some become musicians, where they play pickup gigs. I’ve seen others become golfers, playing the same course over and over again like a gerbil on a treadmill. And they all seem to be obsessed with Viagra or Cialis for some reason. Perhaps the hardest part to retirement is adjusting to the pace. At first, most men treat it like a vacation, but they quickly learn it is a vacation that never ends. Initially, they tend to get more rest, eat a little more than they should, take a trip, putter around the house tackling minor assignments, but then they become bored and restless. Instead of having someone set a schedule for them, like their company and boss, now they have to make their own schedule. Some prefer cultivating vegetable gardens, complete with bib overalls and a straw hat. Somehow I am reminded of Eddie Albert. Tomatoes, corn, and cucumbers are common. The more ambitious farmers try their hand at such things as kale, cabbage, bok choy, okra, snow peas, and a variety of hot peppers. Normally, these are tried only once before reverting back to tomatoes, corn, and cucumbers. For some strange reason, broccoli is avoided at all costs. At high school reunions I would hear classmates boast they were going to retire soon. They do this in such a way as to make it sound like a game, whereby the winner is the person who retires first. They looked forward to sleeping in during the mornings, travel to exotic locations, or catch up on their reading. Inevitably, they find their body is conditioned to sleep a few scant hours and they still rise before sunup, they rarely travel outside of the county, and the only reading they do is in the bathroom. If anything, they become addicted to television shows like “Jerry Springer,” “The View,” and “Dr. Phil.” Not surprising, they develop the habit of talking back to the television screen as if the host could hear them. The only thing stranger is when they offer applause to the television set. The retirees start attending breakfasts and lunches with former colleagues. Inevitably old war stories are told over and over again. Breakfast usually consists of eggs, bacon, pork sausage, goetta, scrapple, pancakes, biscuits and gravy, grits, hash browns, and coffee, lots of coffee. Lunches usually includes pastrami, corned beef, hamburgers, chicken wings, and an occasional glass of beer or wine. It is no small wonder they begin to gain weight. There is also the ceremonial toothpick afterwards. They suddenly find themselves volunteering time to charitable organizations and political campaigns. And they spend an inordinate amount of time in doctor offices, where they develop an interest in women magazines. Retirees discover they miss the socialization they enjoyed at work, which is why they gravitate to group meetings. They realize it is important to their mental health to be able to discuss current events and their observations on life. Without such discussions they become despondent. To keep busy, it is not unusual for them to go to the post office, not just once, but twice a day (once in the morning and later in the afternoon). They also go for haircuts at dawn. Rarely do they really need a haircut as their hair is now thin. More importantly, it is to manicure the wild hairs growing in their eyebrows, ears, and nose. They also spend considerable time at sporting events for their grandchildren, where they can catch up on their sleep. More importantly, I’ve noticed my friends who recently retired get bored easily. Although they pledged to live a life of ease, one by one I see them all going back to take on a job of some kind. Maybe not as rigorous as before, but necessary to practice mental gymnastics. I’ve seen some people become clerks at some of the home and garden superstores, others work at golf courses, and some go back to what they were doing before retiring. Frankly, I do not know anyone who has dropped out completely. Somehow, they all find a way to go back to work. Maybe retirement is not what they thought it would be. In spite of all this, I am considered the “oddball” for continuing to work. I still enjoy meeting and working with people; I still enjoy jousting in debate, but more than anything, I still believe I have a role to play and am not ready for the curtain to fall. Besides, I look kind of silly wearing a hardware store apron. NEXT UP: THE DISAPPEARING MIDDLE CLASS – And how energy independence can alleviate the problem. LAST TIME: TREATY OF PARIS – Today we celebrate an important anniversary. This entry was posted on September 5, 2014 at 6:00 am	and is filed under Life. Tagged: Florida, palm harbor, RETIREMENTLAND, The Bryce is Right, tim bryce. You can follow any responses to this entry through the RSS 2.0 feed. You can leave a response, or trackback from your own site. “You are sooooo right. The neighbor – behind us – is retired from the federal government. He started out as a prison guard (kept him out of the draft and Viet Nam) and then retired as a member of the federal parole board. I threatened to put a sign in my yard with an arrow pointing where he lived. About a year and a half ago – he asked me to come to one of his “retirees luncheons.” I have never spent a more borng 2-1/2 hours in my life! They talked about all the things you mentioned in your article and more. I told him – on the way home – that I appreciated his invitation but I would not be attending any more of his meetings. I know at one point a couple of months back you implied you were in your 50’s Tim… there are not many in their 50’s that can contemplate retirement mentally, physically or financially (all or take your pick) and all too many never get to retire because they make the big “one way trip”. 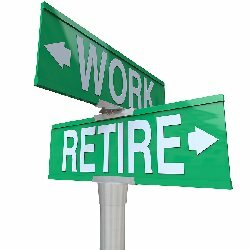 I have a very active life since “retiring” but many of my friends from the previous sentence never had it working and won’t have it retiring. I could NEVER have retired in Canada (nor could any of my busy friends down here in Mexico from the US have retired there) because the cost of living is out of this world and getting “outer” every day. I have played music professionally since I was 12 (I’m 72 now) and still do 3 or 4 nights a week. As an extension of that, I started about 10 years ago playing Santa Claus (I grow the beard starting on July 15th every year because facial hair is a pain) and perform 6 to 7 weeks each year for a very tidy sum of money and have a ball, I maintain 3 not-for-profit web sites, I produce a weekly entertainment guide for the entire area I live in (no charge with 550 getting it), I sit on an endowment fund for the local Shrine club, am secretary of both the Masonic Lodge and the Shrine Club and have a whole bunch of fun to boot… I often muse about how if I wasn’t retired, I wouldn’t have time to work. Some of my friends had boring, life-long jobs (especially government jobs) that provide NOTHING else but a pension to retire on… they never played music, hell, they never had a life. Do you know what’s on my bucket list Tim?… absolutely nothing! I can golf 365 days a year (if I ever get time), when it is time I can get a full service senior residence for less than $1,500 USD per month. In a nutshell, if someone did nothing their entire work career except work (makes Johnny a dull boy) can’t really expect to all of a sudden have lots to do… they just have lots of time to not do anything. We live at the same latitude as Hawaii, at the same altitude as Denver, CO with the second best climate on earth and a very reasonable cost of living… leave the work for the young people! “Always Have Fun”! 1. You forget what day of the week/month it is. You need a calendar at all times to make sure you get where you are supposed to be, when you are supposed to be there. 2. When you work, you usually have the money to do things, but rarely the time to do them. When you’re retired, you have the time to do those things, but maybe not the money to do them. 3. EVERY retiree has said that they are “busier” in retirement than they were while working and wonder how they had time to work. Fact is, there are still only 24 hours in a day, 7 days a week, and 52 weeks in a year. Hasn’t changed in a very long time and isn’t likely to change any time soon. So, you can’t be “busier” – you are just busy doing different things – things you WANT to do, not that you HAVE to do. And, because that big block of time during the day labelled “WORK” is no longer full, you can pack a lot of the little chores you ignored all those years into the empty time now and it just FEELS like you’re busier because you’re getting more things done in the same amount of time.